Estimate the linearity of the measurement procedure. Open the file tutorials\EP06-A Appendix C.xlsx. The worksheet opens showing 3 columns. The Dilution column identifies the levels of the analyte in the sample (5 levels). Calcium identifies the measured value for 2 replicates of sample. On the Analyse-it ribbon tab, in the Statistical Analyses group, click Linearity. In the Y drop-down list, select Calcium. In the By drop-down list, select Dilution. Select Relative values to indicate that the By variable indicates relative concentrations made from a dilution scheme of high and low samples. On the Linearity panel, in the Allowable nonlineairty group, select Across measuring interval, and then in the Absolute edit box, enter 0.2. On the Analyse-it ribbon tab, in the MSA group, click Estimate Imprecision. The scatter plot shows a simple visual assessment of the linearity of the measurement procedure over the measuring interval. The red line shows the linear fit, and the green line shows the best non-linear (2nd or 3rd order polynomial) fit. You should observe the scatter of the points to ensure there are no obvious problems. No individual points stand out as atypical of the bulk of the data. The precision table shows the precision to be constant across the measuring interval at an average 0.12mg/dL which is typical of that expected for the measurement procedure. 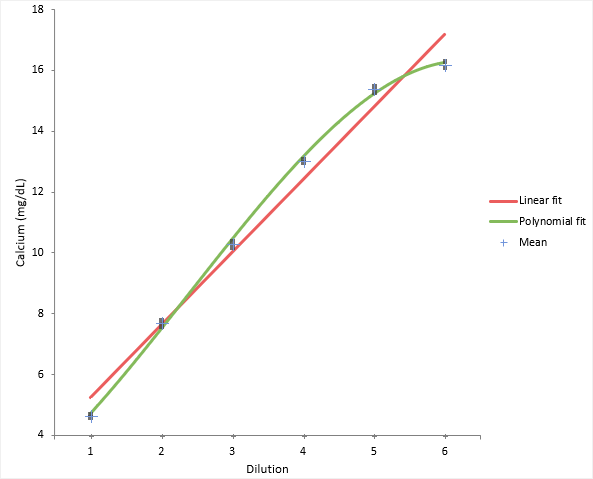 The linearity plot shows the difference between the linear and nonlinear fit across the measuring interval. Five out of the six points are outside the criteria for allowable nonlinear error.